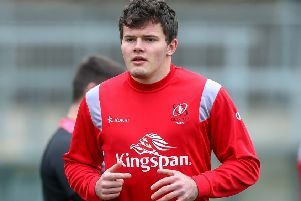 Jacob Stockdale has insisted Ireland have never considered themselves the world’s best Test team. The Ulster wing has admitted he never wants to be on the receiving end of another hiding like England dished out to Joe Schmidt’s men in Dublin last weekend. Stockdale had enjoyed a near-fairytale Test career until Saturday’s 32-20 Guinness Six Nations loss to England, where the stunning form that carried Ireland to last year’s Grand Slam and a victory over New Zealand came to an abrupt halt. Now the 22-year-old wing has been at pains to point out the All Blacks installed Ireland as the world’s best team following the 16-9 November victory - and not anyone in head coach Schmidt’s camp. Asked if there would be merit in reiterating that Ireland never branded themselves the world’s best, Stockdale replied: “Yes exactly; look we know we’re a good side and we want to make sure we don’t let ourselves down on the pitch. “But we know we’re not the finished product, and I don’t think anybody here has ever claimed us to be. “So we’re still trying to work and still trying to improve. “You learn probably more from losing than you do winning. “For me personally that’s a massive point - I don’t want that to ever happen again. “So I’m going to work twice as hard to make sure it doesn’t. Wily New Zealand coach Steve Hansen hailed Ireland as the world’s best team after Schmidt’s men toppled the back-to-back world champion All Blacks in Dublin in the autumn. Schmidt quickly batted aside that assertion, with his side still sat second in World Rugby’s official rankings - well aware Hansen was simply trying to shift some pressure in Ireland’s direction. Stockdale assumed responsibility for Elliot Daly’s try in the England loss, where he fumbled a kick in behind to allow the Wasps flier to dot down. The Newtownstewart native admitted to being stung by the defeat, but pledged that Ireland will refocus quickly - starting with Saturday’s trip to Murrayfield to face Scotland. Stockdale has made a habit of picking off wide passes for interception tries, but admitted he can ill afford to take any risks given Scotland fly-half Finn Russell’s playmaking talents. “It’s a tough one to analyse yourself when you’ve lost and you feel like nothing you did was good enough,” said Stockdale. “Daly’s try where I tried to collect it and it bounced out of my hands, I was really disappointed with that. “I felt like I could have collected it and obviously stopped that try. “I think once you start going looking for intercepts it can be a pretty dangerous game, because Finn Russell is a very smart player, he’s very intuitive. “He’s definitely the kind of player that if he sees you going for it, he’ll let you think you’re going to have it, and then he’ll put the ball past you, or in behind you. “You just can’t go chasing intercepts, and you just have to, hopefully, grab the one that becomes available throughout the game. “For me it’s just about making sure that I defend well, connect with the backline and the forwards around me.